Since I haven’t written the spoilers the last couple of days, I decided I’m going to go over both the most recent spoilers and the ones that Elspethftw wrote recently; so here we go! Cackling Counterpart is the most promising of them, which for 1UU puts a token onto the battlefield that’s a copy of a creature you control; essentially, it’s rites of replication, except only your creatures and there’s no kicker. However, it does have a flashback for 5UU; a little over-costed like all the flashbacks we’ve seen, but Snapcaster Mage can, of course, fix that. They’ve confirmed that Shimmering Grotto from Lorwynn is being reprinted. As it’s staying a common, I have no complaints, it’s actually decent with the tribal lands, turning that into actual colored mana. Thraben Sentry doesn’t look great; a 2/2 with Vigilance for 3W. But when another creature dies he becomes Thraben Militia, a 5/4 with Trample. He’s not great, but he’s only a common, and decent in limited. 3RR for a 2/2 is bad. Even if it’s a flyer with haste. But, he’s not all bad; when he deals combat damage, he gets 2 +1/+1 counter. He really isn’t that bad; he’s over-costed, yes. But he’s not horrific. The format is going to be flyer-light in competitive play with no squadron hawk, so he won’t necessarily get consistently blocked, but he’s still not great. He’d be decent in Limited, but he does not need to be a rare. 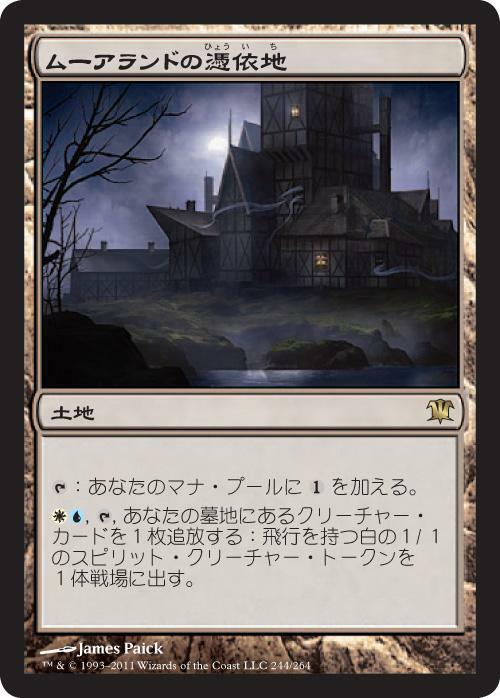 Moorland Haunt is our Spirit Tribal land; for UW, you exile a creature card from your graveyard to get a 1/1 white spirit token with flying. Honestly? 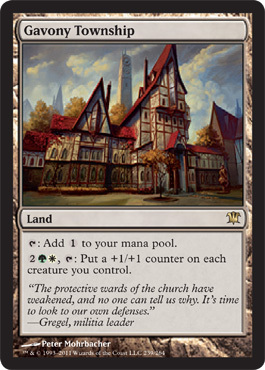 This is a great card; Squadron Hawk was criticized for being a cheap 1/1 flyer that got other flyers; this land produces them for 2 mana per turn. This could see some significant play as it’s already in blue and white, the favorite control colors. There isn’t much to say about Tormented Pariah and Rampaging Werewolf; it’s a 3/2 for 3R that turns into a 6/4 when it transforms. A decent common, it’ll see play in limited. 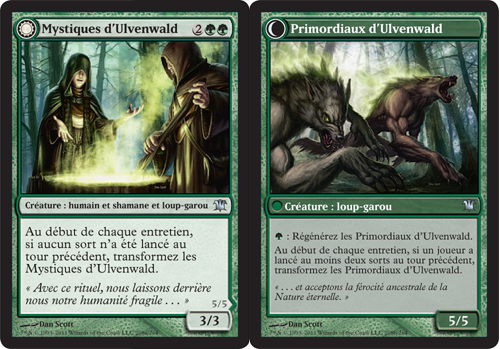 Another translation and another werewolf; Ulvenwald Mystics/Ulvenwald Primordials. A vanilla 3/3 for 2GG that turns into a 5/5 with G: Regenerate? Not bad for an uncommon. This just shouldn’t be a mythic rare. It’s a perfectly fine card, but it does not need to be a mythic rare. A 5/3 with flying, hexproof and indestructible is pretty decent for 5 mana. 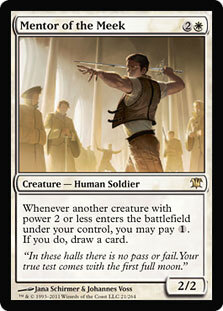 Decent in Commander with Kaaila of the Vast, it really isn’t a bad card, but doesn’t need to be a mythic rare. As we can see, it’s a 3-drop equipment with equip 3 that gives the equipped creature +3/+0, and if the creature is a Human, it gains lifelink. Now, the implications of that are… well, disgusting, as I assume that means it’s humans cutting up other humans and eating them, like Village Cannibal’s +1/+1 counters when humans die. However, It’s not a terrible card, and it’s only an uncommon. Puresteel Paladin can certainly make use of it, and it may see some play in limited. 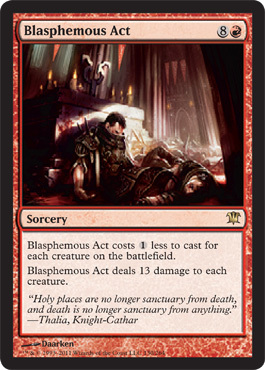 Blasphemous Act is actually a decent card. 8R sounds horribly expensive, but it’s one less for each creature on the battlefield, and does 13 damage to each creature. Again, 13 is the amount of damage to properly overkill everything in the format. Essentially, against some decks this is a complete board wipe for 1 mana at times, but will probably be around 4 mana total, just as much as a Day of Judgment. Only downside is that it deals damage, so indestructible cards (which I don’t think there are any in Innistrad so far) will laugh at this attempt at a board wipe. Honestly, I like it, and I hope they keep up with decent cards. 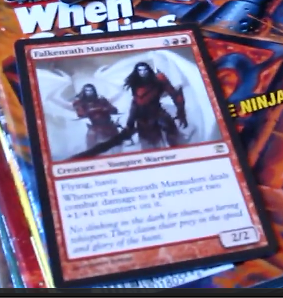 More Mythics, and other spoilers! These are two more mythic rares, and give us a total of 3 mythic rares dedicated to Zombies; and one of these, I’m slightly disapointed in, and in the other one I’m rather impressed. 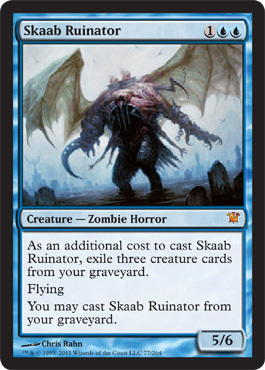 Skaab Ruinator is a 5/6 flyer for 1UU, which is pretty good, right? Well, you also have to exile 3 creatures from your graveyard, which isn’t too bad. It’s possible zombie will end up playing UB with Liliana the Veil to discard and hopefully nuke an opponent’s board. But the greatest part about Skaab Ruinator? You can cast him from your graveyard. So you could remove those three creatures very, very late game to drop this 5/6 on the board again for 1UU. I really like this card, but I hope that Innistrad has some way to put cards back into the graveyard to keep us from completely running out of fuel, maybe a card that says “sacrifice target zombie you control; send creature cards that are exiled equal to the colored mana cost of the sacrificed creature” or something along those lines. 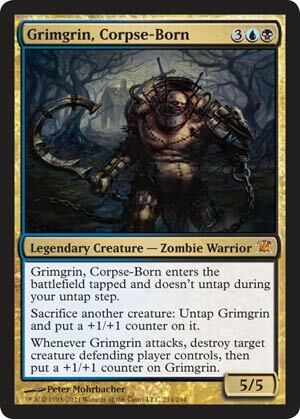 In my opinion, Skaab Ruinator is much better than Grimgrin in comparison of both of them being mythic rares. 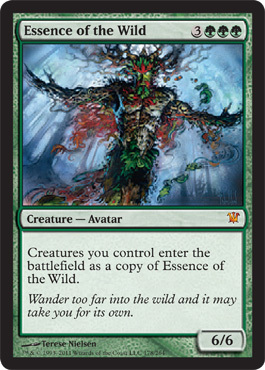 But Zombies aren’t the only mythics here; Essence of the Wild is a card that even Wizards admits is a little silly; creatures you control enter the battlefield as a copy of Essence of the Wild. Birds of Paradise? Nope, 6/6 Essence of the Wild. Darksteel Myr? Nope, Essence of the Wild. Batterskull with a 0/0 germ? Nope, 10/10 with vigilance and lifelink. It’s a pretty silly card, but it’s not really great. It could be a bomb in limited, but otherwise? Not all that great. It may see play in Birthing Pod as Daily MTG suggests, as 6/6 Birds of Paradise can always be fun. 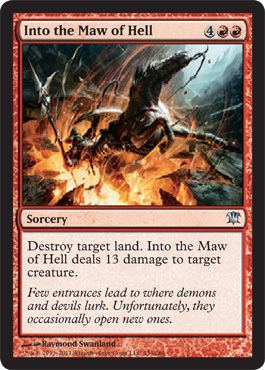 However, outside of the mythics, we’ve got a couple of uncommons, and so we see Into the Maw of Hell, which for 4RR destroys a land and deals 13 damage to target creature. 13 damage! As Mark Rosewater pointed out, 13 is a theme in the set, so if it’s gonna over kill something, it’s gonna say 13 on it. If Ludevic’s Abomination is a big worry for you, don’t worry, Into the Maw of Hell has you covered. I’d be excited for this if it wasn’t a 5-drop. 3BB gives you a 4/4 with a morbid ability; when it enters the battlefield, if a creature died, target creature gets -4/-4 until end of turn. It’s a mini-dismember on a 4/4 stick for 5. 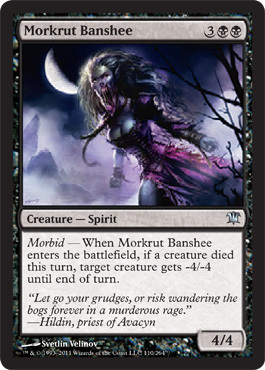 If it wasn’t yet another 5-drop it could see play in Morbid Pod, but it doesn’t look like Morbid Pod will ever happen, as they haven’t printed enough playable morbid cards for it yet. If this was a 4-drop it’d be perfect. However, that’s all the spoilers for now, I will, of course, put up spoilers as I find them. That… that says 13 2/2 black zombies, doesn’t it? Here we have yet another mythic rare, Army of the Damned. We asked for more zombies, so we’re getting more zombies. Rather, this is a sorcery and we haven’ t seen any zombies outside of Diregraf Ghoul and Stitched Drake. But for 5BBB (8 mana) you get 13 2/2 black zombies into play tapped. The tapped is most likely to prevent any sort of haste enabler to win the game right there, as you’re putting 26 power on the board for only 8 mana, getting roughly 18 more power than you paid mana. It makes Blade Splicer’s 2W for a 1/1 and 3/3 look silly by comparison. Then again, Blade Splicer is more playable, as this is 5BBB, with triple black making dual-colored decks slightly more difficult to actually play this with the multiple mana sources. Regardless, it also has a flashback of 7BBB, meaning you can drop 10 mana and do it all over again. With U/B being the colors zombies are in, I wouldn’t be surprised to see Snapcaster Mage have this go off twice for its original mana-cost instead. It’s more of the Praetor’s Counsel of this set; great effect, really expensive. If your opponent doesn’t have flyers, then this card is going to wipe their entire board, as when it deals combat damage to a player, it’ll deal the damage about to each of that player’s creatures; being a 6/6 wipes out even the titans under your opponent’s control. 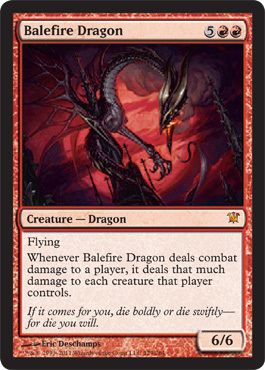 Granted, Balefire Dragon is 5RR, and most likely won’t see play in standard, but I think it will see considerable play in Commander. Another Mythic which isn’t great, but another card that may see some play. None of these spoilers currently have pictures to go with them, but the source is here, being confirmed at Pro Tour Phili. Feel free to catch up on all of them. You don’t want to see his trophy room. Slayer of the Wicked is another Flavorful card, a 3/2 for 3W that kills vampires, werewolves, and zombies. Like Elite Inquisitor, unless the tribal decks become big, this won’t be very good. However, he’s decent for an uncommon, and will probably see some play in limited. Personally, I like Snapcaster Mage. A 2/1 for 1U with Flash and gives instants and sorceries flashback until end of turn? Giving Day of Judgement or Ponder a flashback option is always great. A decent rare, but not a chase card. Whenever another Human dies, put a +1/+1 counter on Village Cannibals. They have endured the horrors of Innistrad by becoming the worst monsters of all. This is a card I wanted to see the art for. Cannibals? In Magic? Zombies we see all the time, but Cannibals? However, Village Cannibals is not a bad card, it could be sided if you’re playing Zombies vs Humans. But, Village Cannibals is an uncommon, and a decent one at that. 2/3 is a little small for a 4 drop (3R) but for a 5/5 is great. Instigator Gang gives all of your attacking creatures +1/+0, and he transforms with the werewolf rule. He becomes Wildblood Pack, a 5/5 with Trample that gives your attacking creatures +3/+0; meaning he becomes a 8/5 trample when he’s attacking. A great card in my opinion, I’m hoping he sees some constructed play when werewolves hit the scene. Garruk Relentless is not just Garruk Relentless, but Garruk, the Veil-Cursed. Garruk is at the magic planeswalker number of CMC 4, 3G. He transforms when he hits 2 loyalty, which isn’t difficult when he’s at 3 to start. However, he has 2 zero abilities, which are both decent. Garruk deals 3 damage to target creature, then he takes their power as damage. Against a 1/1, he would kill the 1/1 and transform. I’m not sure what the rulings on him are going to be, but as Garruk, the Veil-Cursed, is he treated as a different planeswalker? If so, he’s better than I’m assuming. Otherwise, his other zero will be more used, putting a 2/2 green Wolf into play, which is rather good with Mayor of Avabruck’s transformed Howlpack Alpha pumping wolves and werewolves. I assume that Garruk can’t transform back, however. Garruk, the Veil-Cursed, which is black and green (as people predicted), has a +1 that creates a 1/1 black wolf with deathtouch, which I honestly love. It’s flavorful of his curse, and 1/1 deathtouch wolves are cool, once against with Mayor of Avabruck’s Howlpack Alpha pumping them to 2/2’s. His -1 sacrifices a creature to search your deck for a creature and add it to your hand. It’s good, letting you pop some of those wolves to get something you need, or even helping you trigger morbid abilities. His -3, however, is Overrun with a catch; it’s +X/+X where X is the number of creatures in your graveyard. It’s a decent ability for such a low ultimate. 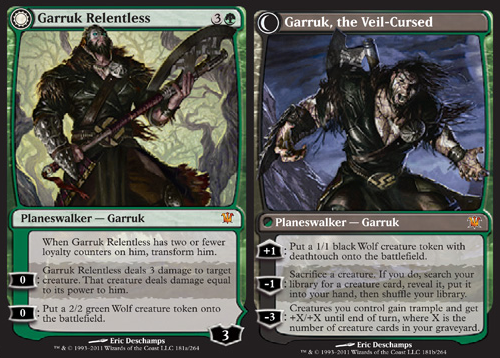 All-in-all, Garruk Relentless/Veil-Cursed will see more play than Liliana of the Veil, sadly. However, Garruk isn’t the only card spoiled! This card with a very long name, Endless Ranks of the Dead, creates X 2/2 black zombies, where X is half the number of zombies you control, rounded down. Wow. I actually really like this card, as long as they print some decent zombies in the set. If not dealt with, they could become a problem, especially several of them on the field at a time. This could be crippling against white weenie. That is, if it didn’t cast 5 to play. Terrible rare, hope I don’t get them. Liliana of the Veil Announced! Liliana of the Veil has been announced, and it is glorious. The +1 ability isn’t fantastic, causing both players to discard a card, and neither is her -2, which causes target player to sacrifice a creature. Now, with the graveyard mechanics of Innistrad, the +1 on this card could be very useful here if there’s actually more exposed cards that actually work out of the graveyard. It’s possible this will see play outside of Standard with Dredging; seeing as you have no problem milling yourself in Dredge, you also don’t have a problem discarding your big creatures to Reanimate. Her -6 might as well read that your opponent enters scoop phase. You separate all of your opponent’s permanents into two piles, then your opponent chooses which pile to keep. As it’s all permanents and not non-land permanents, you’re destroying their mana base, too, regardless of which pile they choose, if you do it right. This is all with 3 loyalty on a 1BB planeswalker, the same converted mana cost and starting loyalty as Jace Beleren. It’s a huge step up from Liliana Vess. I’m definitely picking up a playset of these. However, Liliana wasn’t the only card spoiled. 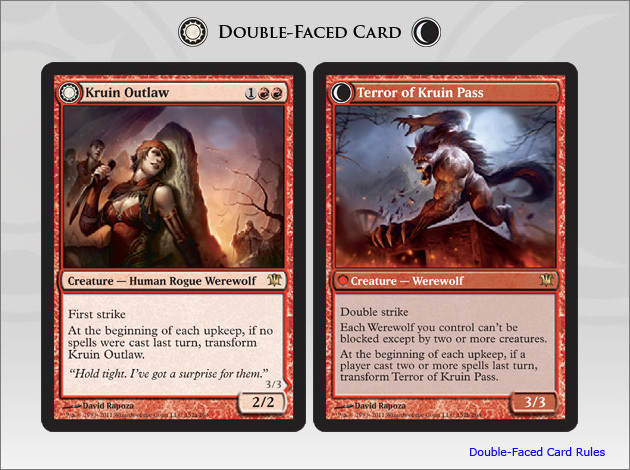 Kruin Outlaw is a 2/2 First Striking Human Rogue Werewolf for 1RR, who isn’t bad by herself, but when she transforms you get Terror of Kruin Pass, a 3/3 Double Strike that prevents your Werewolves from being blocked except by two or more creatures. 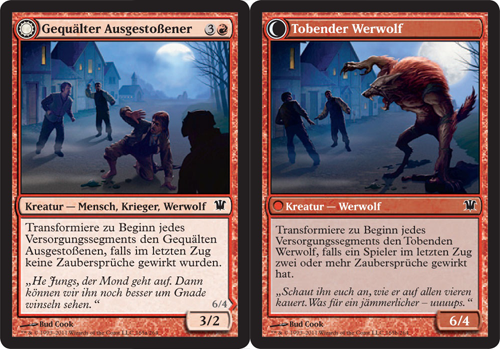 The way werewolves work together by making each other better (as seen with this card and Mayor of Avabruck) reminds me a bit of slivers, albeit not in every color. 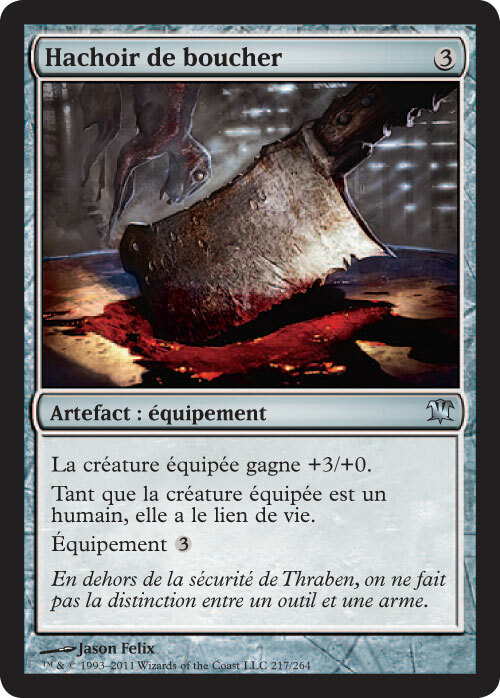 However, Terror of Kruin Pass is a great card as far as werewolves go, and I hope it actually finds a place in Standard. 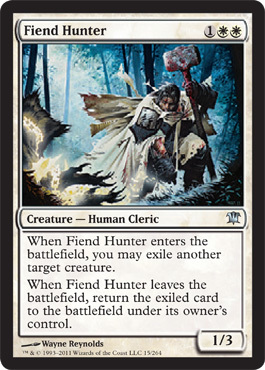 Our last spoilers here is Fiend Hunter, a 1/3 Journey to Nowhere on a stick for 1WW. He’s not terrible, but easier to kill than Journey to Nowhere for the same amount of mana as an Oblivion Ring. 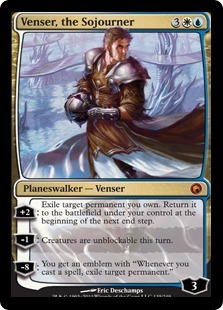 It’s possible he’ll see play with Venser, the Sojourner, but it’s unlikely. Fiend Hunter may be decent in draft, but I don’t see it having a lot of play in Standard. 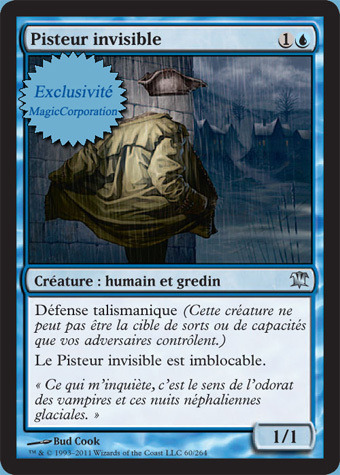 Not a difficult card to translate, this is Invisible Stalker, an interesting little card. For 1U, you get a 1/1 Hexproof who’s also unblockable. It’s a decent little card, being a little more dangerous in draft than Tormented Soul as it’s also hexproof and will continuously poke your opponent for the one damage. As a hexproof, you’ll still be able to give it Wreath of Geists, so this unblockable could get there.